Norway Just Deported 824 Muslims, Every American Needs To See What Happened Next. Don’t worry Muslims. The moron in the White House will no doubt take you in. Federal judge tells deported Mexicans they can come back now. After all, we feel bad that maybe we hurt someone’s feelings. Rep. Peter King Rips Conservatives: ‘I’ve Had It With This Self-Righteous, Delusional Wing Of The Party.’ Talk about self-righteous and delusional. Smidgen Alert – IRS Withheld Document From Inspector General Showing Existence Of IRS Email Tapes…. There’s getting to be more smidgens in Washington, DC than pigeons. Cap-And-Trade Costs California Businesses $1 billion. Hey moron California voters! Guess why your gasoline is back up to about $3.35 a gallon this weekend? 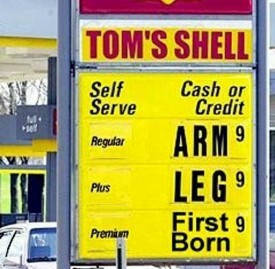 Meanwhile the national average everywhere else is about a dollar a gallon less. Documents Obtained by Judicial Watch Reveal Top Hillary Clinton Advisers Knew Immediately that Assault on Benghazi was Armed Attack. But…but…ant-Muslim video….sputter…sputter. Barack Obama: ‘I loved Spock.’ Must be because they had matching ears. Mirror mirror on the wall whose got the biggest ears of all? Senate Passes One-Week DHS Funding Bill; House Expected to Approve. McConnell gets to bend forward for the conservatives, too! And Ta Da! So does Harry Reid. GOP Revolt Crashes DHS Spending Bill Hours Before Shutdown, Handing Huge Defeat to Boehner. Today’s feel good story. Now he can bend forward for the conservatives. ‘No You’re Not!’ Former NSA Chief Heckled for Calling Himself a ‘Libertarian’ at CPAC. We’re not sure what’s funnier. This? Or Clint Eastwood’s empty chair. Exclusive: Chicago nears fiscal free fall with latest downgrade. Meet the new Detroit. Russian Politician Boris Nemtsov Killed in Moscow. We wonder if certain Democrats gave this a like on Facebook? 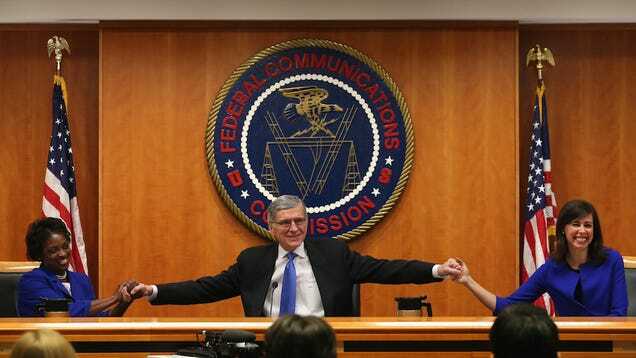 The FCC on Net Neutrality: Be Careful What You Wish For. We wonder what all the gleefull libtards will say when they find out this is another typical government fustercluck? We won! Let’s do the fairy dance! Goodbye, Mr. Spock. He lived long, he prospered, and who knew that split-fingered salute he was always flashing was a Hebrew letter signifying the name of God? Talk about putting one over on Hollywood! As NASA spacecraft approaches dwarf planet Ceres… Ceres evinces two bright lights. Warning lights, welcome lights, or reflections off a giant alien monolith? We’ll find out March 6. DC Comics’ Catwoman comes out as bisexual. Are there any comics left without LGBT, Muslim, or environmental whacko superheroes? What’s next, Captain America turns out to be a Soviet sleeper agent? Breaking News: FCCCP Approves New Internet Controls. Let the age of Internet monopoly, censorship and the Government control of information distribution begin! Bill Nye the Sieg Heil Guy Claims Jews are Hated and Targeted Because They Haven’t Been Good Enough Neighbors: Hey Bill Nazi Germany just called, they want their domestic policy back. BREAKING: Senate Committee Approves AG Nominee Loretta Lynch. You can thank RINO’s Orrin Hatch, Lindsey Graham and Jeff Flake. The GOP is dead. Figures. James Clapper Contradicts John Kerry Less Than 24 Hrs After His Testimony Before Congress. As usual Kerry is playing ketchup. How to handle an employee’s offensive social media post You report them to Interwebs-oberfuhrer Tom Wheeler and expect they’ll receive a fine, jail time or have their Internet usage license revoked? FCCCP tweaks net monopoly plan after Google push: Because the only way for Interwebs-oberfuhrer Tom Wheeler to protect the people from greedy businesses is by ignoring their elected representatives in congress while allowing for one of the biggest corporations on the planet to write the rules for themselves and more importantly their competition. From battle to ballroom: Double amputee war hero Noah Galloway’s amazing journey to ‘DWTS.’ Here’s a bonafide American hero, one of thousands. With all the crap weasels running around the country we felt compelled to put a post up about this guy. Not that the crap weasels will ever get it. Byron Allen Goes To War With Sharpton, Obama, Comcast For Future Of Black Media. “I think that Obama uses him to control the Negroes,” Allen said of Sharpton.” Mr. Allen better prepare for the coming attacks and slander from the left.